When it comes to super fast performance rigs for gamers, the name Digital Storm would surely ring a bell among others in the industry. 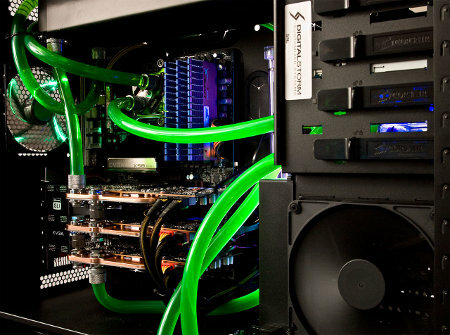 What Digital Storm has wrought this time around would be to introduce their Black|OPS gaming system range that will be equipped with NVIDIA’s GeForce GTX 580 running – nay, purring within. With all the additional power underneath the hood, gamers will now be able to leverage the unparalleled performance of the world’s fastest DirectX 11 GPU, leaving you to way to weasel out of a crushing defeat by complaining that your hardware is not up to snuff. Why not check out more of what the newly equipped Black|OPS gaming system range has to offer in the extended post? Let us take a closer look at the GeForce GTX 580 first – this is touted to be NVIDIA’s flagship GPU which is capable of delivering a seamless gaming experience unlike any other. Not only do you experience overall improved performance and an innovative vapor chamber thermal design, the GTX 580 will also make short work of the latest games without making too much noise compared to its predecessor. Not only that, the new processor supports all the premium GTX gaming technologies, where among them include NVIDIA Surround, 3D Vision, PhysX and SLI. For those who are interested (and have a little extra in their bank balance), they can pick up Digital Storm’s Black|OPS systems with NVIDIA’s GeForce GTX 580 from $2,108 upwards. Of course, the type of stuff you get inside really depends on your budget, so those who are rather tight this month might want to wait until their Christmas bonus arrives.